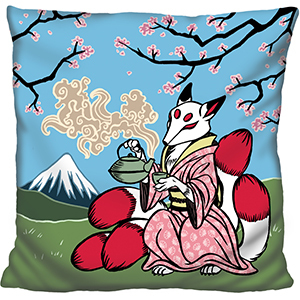 Kitsune Woodcut Pillow: An Adorable Fuzzy Plush to Snurfle and Squeeze! Being the many-tailed fox of Japanese folklore seems like a cushy job, doesn't it? When you're mythological, you don't have to study for tomorrow's calculus exam or stand in that extra-long line for your morning latte! But even so, constantly shifting shape is hard work! That's why at the end of a day full of playing pranks on travelers, flashing lightning out of your mouth, and keeping all your tails silky, a Kitsune just wants to relax! This lovely fox-beast is winding down by putting on her favorite kimono and pouring herself a nice, hot cup of tea. Relax with her over a mountain view with cherry blossoms while you contemplate a tomorrow full of important Kitsune business!